Comic books I bought the week of 30 January 2008. Unleashed is the final of four collections of Marc Andreyko’s Manhunter, about a prosecutor who becomes a superhero who’s willing to kill the villains who escape the legal system. The series was acclaimed for its strong female hero who also had realistic flaws, such as being a chain smoker and divorced. But it didn’t sell very well and was cancelled. Fan outcry led to it being un-cancelled for a few more issues, which are collected here, but as of this writing it looks like its day really is over. The main story in this volume involves Wonder Woman hiring Kate Spencer – Manhunter’s civilian identity – to defend her in a grand jury trial regarding her killing of Maxwell Lord. The motivation behind the killing is part of the ongoing brouhaha surrounding DC continually trying to reinvent itself this decade, and I won’t go into the details here. Fortunately, I don’t need to, since the story is nicely self-contained, and used as a vehicle for Manhunter to gain a better understanding of her place in the superhero community. The “B” story is about Manhunter’s friend and ally Cameron Chase dealing with an old enemy of her father’s kidnapping her sister, which is also fun. The book definitely hit its stride in the third and fourth volumes, having seemed rather disjointed and heavy-handed in the first. I still wouldn’t characterize it as more than average superheroics, albeit with a little more reality injected into the story (Kate’s bad at keeping her identity a secret, and gets the stuffing beat out of her in some of the fights, for instance). Still, average has plenty of value and I’d probably read it if a new series came out. Which it could, since there are all sorts of loose threads at the end of this volume. But I’m doubtful that DC will give it another shot. It seems like everyone wants to bring back a team of obscure heroes from yesteryear and put them in a modern context. J. Michael Straczynski’s doing The Twelve over at Marvel, and now Alex Ross is working the same angle, this time using many of the Nedor Comics characters that Alan Moore did in his Terra Obscura series of a few years back, as well as the original Daredevil. The premise begins with the notion that Pandora’s Box was responsible for releasing both the evil of the Nazis in World War II, and the many superheroes who sprang up to fight it. One hero, the Fighting Yank, is charged with returning all the heroes to the box in the hopes that the evil with follow. Decades later, in the present day, he learns that he was apparently tricked, which I presume sets the stage for the release of the heroes from the box into the present day. Like Straczynski’s comics, I’ve been disappointed with Ross’ books since Kingdom Come, mainly because of his stories’ tendencies to have very “uncompressed” storytelling – i.e., they’re slow-moving. And the payoff often doesn’t seem to live up to the grandiose set-up. While Ross’ art is always lovely, he often leaves the art chores to others. Project Superpowers leaves the art to Stephen Sadowski who’s got the skills to pull this off, but the textured feel of his pencils – which appear not to have been inked – and the bizarre coloring job which leaves every character with some peculiar highlights seem to undercut the four-color feel of the characters. The story’s okay, with the feel of a tragedy unfolding in slow motion as the Fighting Yank essentially betrays his friends. But this issue’s just the prologue – presumably once the heroes are released the real story starts. The question is: What will it be, and will it be worth it? Comic books I bought the week of 23 January 2008. Another comic I’ve been reading for a while – since it started, in fact – but haven’t often commented on is Linda Medley’s Castle Waiting. The premise is that the castle is that of Sleeping Beauty, but the characters are various less-well-known figures who flock to the castle after the princess has departed with her prince, and who form a community. The book follows their day-to-day lives – in stark contrast to the drama and adventure of Bill Willingham’s Fables at DC – and sometimes considers what happens to the characters after their “happily ever after”. Medley is an interesting artist with a terrific facility for drawing characters who look different and who have dynamic facial expressions (see this month’s cover, for instance). Her use of grays is sparse, so the book is truly black-and-white. I sometimes wonder if her art would work better in color, although I think I’ve seen her do a couple of things in color for major publishers and was disappointed. The weakness in the book is that the writing is very inconsistent. When the series first started, it features short, 2- or 3-issue stories, often focusing on different characters each time, and there was a real sense of time passing, things happening, and people living their lives. Then the series lapsed into a lengthy and – to me – uninteresting tale of a group of bearded nuns, one of whom eventually came to live at the castle. While I understand Medley’s interest in exploring her characters’ backstories and in telling longer stories, this lengthy flashback felt like it brought the series to a screeching halt. Despite this, I was pretty excited that the whole series would be printed in hardcover a few years back, and then was bitterly disappointed when the actual product had dimensions considerably smaller than a normal comic book, compressing the nice artwork to a tiny size and making the whole package much harder to read and appreciate. I guess I understand that comic-book-size is hard to sell in bookstores, but compressing the art seems like it’s always going to be a bad idea. Anyway, Medley returned to the series, this time published by Fantagraphics, and it’s again been a lengthy story, although this time set in the present. It concerns a group of (I guess) dwarves who have arrived to help remodel part of the castle, and what everyone finds when they punch through to a hitherto-unknown passageway. There have been a couple of flashbacks about Lady Jain (who arrived at the castle at the beginning of the series, very pregnant, and who I think of as the series’ nominal protagonist) and what appears to be her uneasy relationship with a man she was engaged to, and presumably married (unhappily). But otherwise the story’s been slowly moving forward in the present day. Fortunately, this latest issue feels like a big step forward, as the characters figure out some of the secrets of the passage, while another mystery begins when Jain spots a mysterious figure in the distance. It’s the best issue in quite a while. The series’ achilles heel is when it spends too much time in flashback, or too much time in slice-of-life mode. Fiction works best when it’s about the characters as they are now, and having things happen to them. And Medley can tell good stories about things happening, and taking unexpected turns. But as the series goes on, she seems to spend more and more time with characters just talking, and talking about their past, and that’s a lot less interesting. She doesn’t need the adventure of Fables to make the book engaging, but the story’s often a lot thinner than it needs to be to keep me engaged. Review of the film The Golden Compass. Friday night we saw The Golden Compass (2007), the film adaptation of Philip Pullman’s novel Northern Lights (released in the US as The Golden Compass). Although it’s been in the shadows of the mega-popular Harry Potter books, Pullman’s trilogy, His Dark Materials, is smarter, cleverer, and more challenging than Rowling’s series. At times it’s maybe too smart for its own good, but that time is in the third book of the trilogy; Northern Lights is inventive, beguiling and exciting. I didn’t get around to re-reading the book before seeing the film, so my memories of the book are hazy, but judged strictly as a movie, The Golden Compass is enjoyable but is built on haphazard storytelling. My recollection is that the book spends a great deal of time crafting its setting and the many inventive creatures and cultures the heroine Lyra (Dakota Blue Richards) encounters. The film spends a little time at the beginning setting up Lyra’s position as a gutter-rat who happens to be the ward of the scholar Lord Azrael (Daniel Craig, who’s essentially wasted in a role with only one meaty scene), but otherwise thrusts Lyra rapidly from one situation to another with very little transition between events. While this is a risk in turning any modern novel into a film with a running time under 2 hours (in this case, 113 minutes, including credits), I think the filmmakers just did a poor job here, and since Chris Weitz is both director and screenwriter, I think the blame falls on his shoulders. TGC spends its lingering shots on the special effects, and although the animated bears and giant zeppelins are very impressive, that time would have been much better spent on character moments. The film also wastes precious minutes on scenes that have almost no value, like Lord Azrael’s arrival in the north, or a solitary scene with the nasty Mrs. Coulter (Nicole Kidman, who at least gets more to do than Craig) musing about Lyra in the company of her daemon. What was Weitz thinking? And with all that the film still ends with a cheesy speech and well before the end of the story in the book. While the book does end in a cliffhanger, it’s really no less unfinished than the abrupt ending of the film, and it deliberately sets up the adventure in the second book. The sequel film – assuming this one did well enough for it to finish production – is going to have a weird opening in order to get Lyra where she needs to go. Oh, and to add insult to injury, the closing credits roll with an amazingly crappy song sung by Kate Bush. Ee-yuck. So what did the film do right? Well, Richards is terrific as Lyra, effectively conveying the emotion and intensity of the character. The armored polar bear, Iorek Byrnison (voice of Ian McKellan) looks great, moves great and overall is another triumph of the ever-evolving technology of digital special affects. The daemons – creatures bonded to every person in Lyra’s world, embodying each person’s soul – also look great, and their constant presence really underscores the differences in Lyra’s world. The acting is generally fine, but really no one besides Richards and McKellan really gets much chance to show their stuff; the cast is too large, and the scenes too short. There are several very effective scenes, too. The scene where Iorek Byrnison gets to redeem himself among his people is an even better battle sequence than the film’s climax. And the scene where Lyra and Iorek strike out across the snow to investigate a lone shack in the next valley is chilling from start to finish. But overall The Golden Compass really could have benefitted from a longer running time (the first films in the Lord of the Rings and Harry Potter series were each nearly 3 hours long, why wasn’t this? Even the first Narnia film was 25 minutes longer), and a smoother script. It’s not so much a bad film as a lightweight one, and “lightweight” isn’t something the book can easily be accused of being. Comic books I bought the week of 16 January 2007. In fact, it’s such a light week that I have little to say about any of these books! Especially since most of them are issues in the middle of a multi-issue story. They were generally good reads, though. Actually, I haven’t yet cracked the Modern Masters volume, but I’m looking forward to it. Mark Schultz was the writer/artist behind Xenozoic Tales – and still is, except that no new issues of that comic have been printed in over a decade. It was a terrific mix of science fiction, fantasy, pulp adventure, and absolutely stunningly beautiful artwork. It’s one of the ten comics I most regret having ended too soon. Schultz has worked as a writer in comics off and on since then, but nothing I’ve seen by him has equalled Xenozoic Tales. I’m hoping I’ll see some new artwork and learn some new things about this wonderful series in this MM volume. San Mateo County Sheriffs Dept raids our home game (it was the season ending freeroll tourney). 10+ armed (and some heavily protected) officers stormed into the home where we play a majority of our home games. 20 of us were there for the freeroll tourney. Two people were arrested and a 13-year-old was referred to Child Protective Services after undercover officers determined a San Mateo house was holding illegal Saturday night poker games. I can’t figure out from these reports exactly what happened, or in what way the game was illegal. It sounds like either charging a fee for food and drinks was considered illegal, or that there was a more general suspicion that one participant was scamming the others out of money. The blogger in the first link above says that the poker group is “a tight group with over 100 friends”, but how tight can 100 people really be? That large a group, with people coming and going, seems like a risky proposition when gambling is involved. Heck, it could be as simple as someone showing up for several sessions, losing consistently, figuring he couldn’t possibly have lost because he’s a bad player, and called the cops. So I don’t know what happened. But it does seem too bad that the police couldn’t find a way to avoid ruining the afternoon of a whole bunch of innocent people. 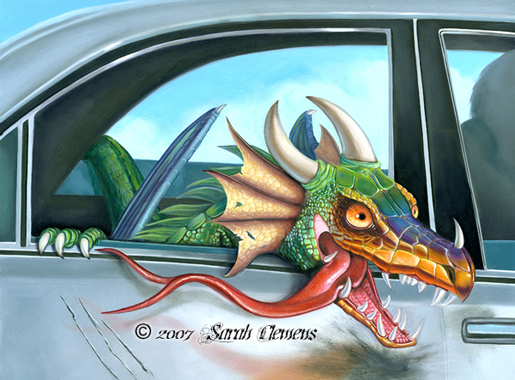 The frightening thing is this: What’s to stop this from happening to any home poker game? Poker is legal in California, although regulated. Where’s the line this group crossed? Or was it just one bad egg that the cops were targeting? I wonder if we’ll ever find out? However, since my birthday fell on Wednesday this year, last night a bunch of us gathered at Subrata and Susan’s house for gaming night, and Debbi went by the Prolific Oven and picked up a couple of my favorite cakes, as well as ice cream. Chad’s wife Camille brought some homemade ice cream as well. Ten people showed up and we polished off most of the cake. After cake we played a game of Union Pacific, which I often term “The best game I own that Subrata doesn’t also own.” I somehow managed to pick up the majority stake in the Union Pacific “super-railroad”, which ended up being enough to claim overall victory despite Chad making a late run and nearly catching me. The final scoring-round card ended up being on the very bottom of the deck, probably making this the longest UP game we’ve played. Nonetheless it’s still a nifty game in that it only took 2 hours for us to finish (maybe less). 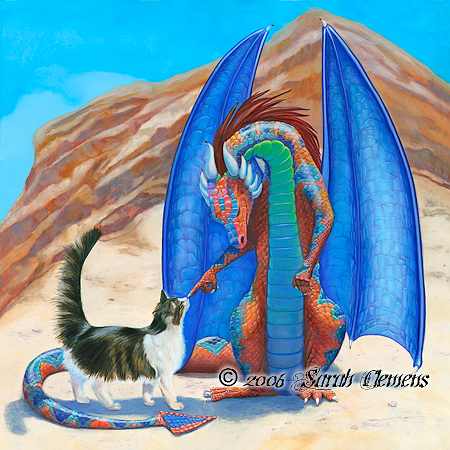 Susan also gave me a birthday present: A print of a painting in a series by Sarah Clemens, who is doing a series (and writing a book) about a couple raising a cat and a dragon together. (Specifically, they gave me a copy of Shaking Hands. They have a copy of Joyride themselves.) I’ll have to frame it and put it up. This was just the sort of birthday party I wanted this year, something low-key and simple with my friends. I’ve thanked Debbi repeatedly for putting it together. I really appreciated it. Today I’m 39 years old! For my birthday, Debbi bought me a Mosquito RC helicopter, which I spent some time flying around last night. Roulette and Newton were both fascinated by it. I managed to get it hovering pretty good, but wasn’t so good at moving it where I wanted it to go. Practice practice! I’m impressed with how long a charge of its battery pack lasts – it gave me a good long time to figure out some of the basics (like “don’t run into the ceiling”). Dad, meanwhile, bought me the James Bond Ultimate Collector’s Set, which will keep me busy for a while. Plus, now I can finally see the two Pierce Brosnan Bond films I haven’t yet seen in their entirety!